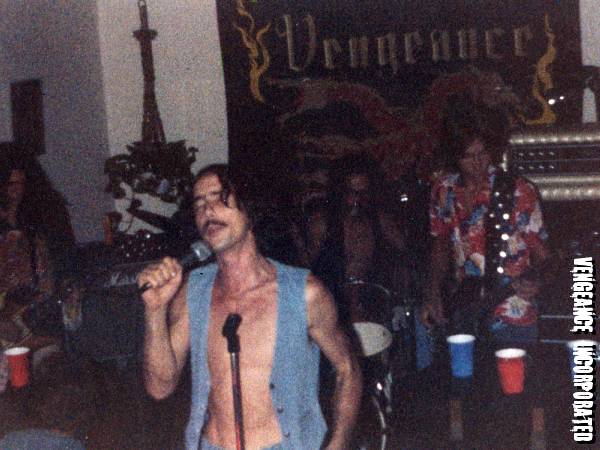 Vengeance was the name Guy (lead guitar, vocals), Mendel Schenck (bass) and Herb DeRochemont (drums, later bass) came up with for a band just before they were to play a keg party NYE ’81. In desperation, Herb and Guy started looking through Guy’s LP collection at song names for inspiration. Herb suggested an idea from the Thin Lizzy song “King’s Vengeance” from the LP Fighting. 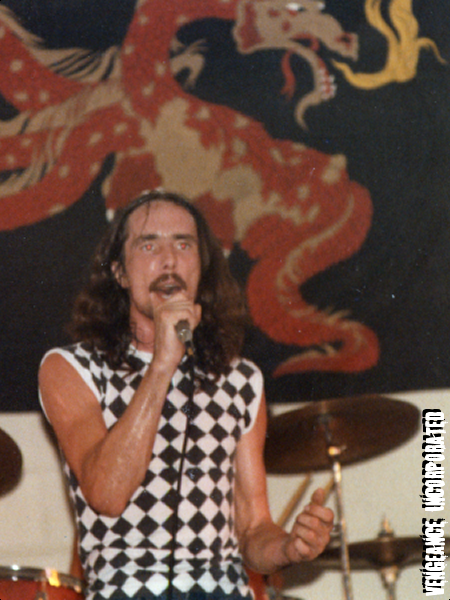 Carl Bennett joined as vocalist and the band played keg and living room parties around Brandon and Tampa. These photos are from one of these parties, note Guy’s stylish Dashiki and Mendel’s tuck & roll metalflake white Kustom bass amp. Herb’s brother Henry is fighting for theMiketo sing on Doctor Doctor. 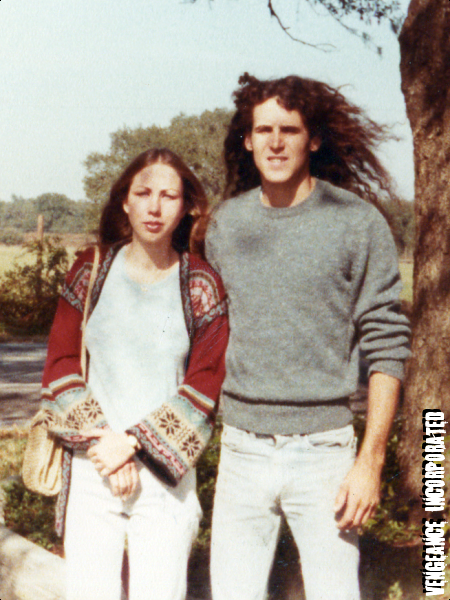 The last pic isGuyand his girlfriend Liz “Eli” O’Brien, who ran sound and did artwork for the band. She painted the big dragon backdrop and designed the lettering for Vengeance, based on the font from Rainbow’s Rising LP. Guy bought his first B.C. Rich, a mahogany Mockingbird, followed by a mahogany Rich Bich, as well as his first Marshall amp. The songlists of that era included Ozzy, Klaatu, Black Sabbath, Riot, Queen, AC/DC, Priest, Rainbow, Gillan, Deep Purple, Scorpions and Def Leppard. 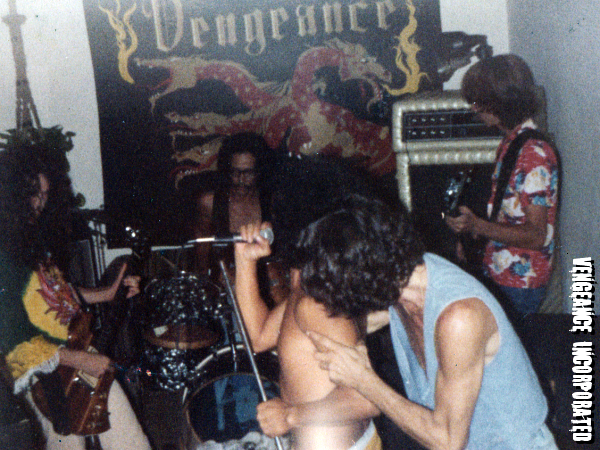 The first group of mp3s are songs from the first Vengeance gig NYE ’81, withGuyon guitar, Herb on drums and Mendel on bass. 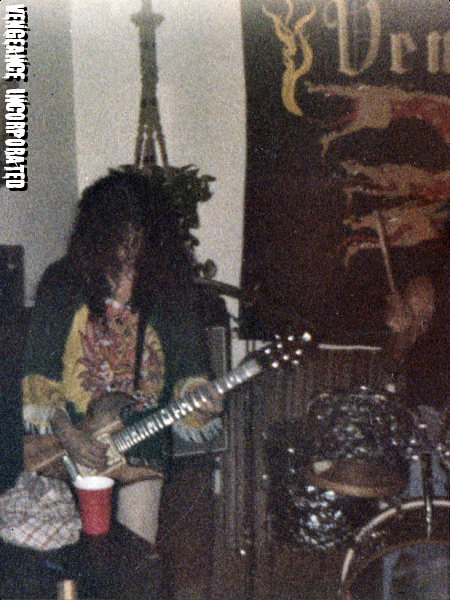 The second group is from a party at aGuynamed Robert’s house, with Herb on bass,Guyon guitar,Carlon vocals and Guy’s brotherMitchon drums.Mikefirst saw the band at this gig and talked to the guys after the party about joining, and Vengeance became a 5 piece not long after that. Heaven and Hell features a nice drum solo by Mitch.